MINNEAPOLIS— In accordance with an agreement with the Center for Biological Diversity that speeds up protection decisions for 757 species, the U.S. 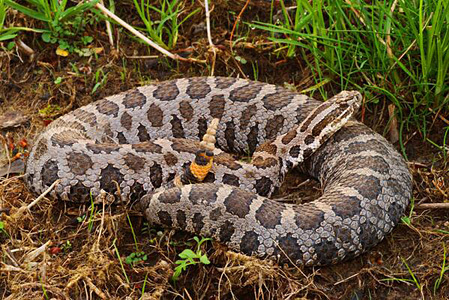 Fish and Wildlife Service today proposed to protect the eastern massasauga as a threatened species under the Endangered Species Act. The reclusive, nonaggressive rattlesnake has been waiting for protection for more than 30 years. Eastern massasauga rattlesnake photo by Mike Redmer, USFWS. This photo is available for media use. Draining wetlands for farms, roads and urban development has eliminated much of the wetland habitat used by massasaugas for food and shelter. The snakes are not long-distance travelers, so roads and other obstacles also prevent them from moving between wetland and upland habitats, which isolates remaining populations and leads to downward population spirals. The Fish and Wildlife Service has identified disease as a “potentially catastrophic” threat to the snakes, whose deaths are also caused by people striking out at them out of misplaced fear. The eastern massasauga is found in wetlands across the Midwest and Great Lakes, including Illinois, Indiana, Iowa, Michigan, Minnesota, Missouri, New York, Ohio, Pennsylvania, Wisconsin and Ontario, Canada. Within this large area the number of populations and the number of snakes within populations have steadily shrunk; the species is now extirpated from 40 percent of the counties it historically inhabited. To date 142 plants and animals have received protection as a result of the Center’s 2011 agreement, and another 66 are proposed for protection. Read more about the Center’s 757 agreement and the Center’s campaign to address the amphibian and reptile extinction crisis. The Fish and Wildlife Service identified the snake as a “candidate” for federal protection in 1982. It is listed as endangered, threatened or a species of concern in every state and province in which it lives. The public has 60 days to comment on the proposed listing announced today.